Imagine if all your favourite foods were taken away and every evening you wondered how long this could go on? Perhaps then you can begin to understand what I just experienced. Thick, wet, heavy snow covered everything including these elk, me and my camera. The elk seemed strangely oblivious as they appeared like sentries guarding a tree. I like the muted effect of the snow. Back in early November, I took a few shots of elk in snow on a trip out to the mountains. Little did I know then how long it was going to be before I took my next wildlife shot. While archived wild animals kept appearing on my blog, I was wandering back roads and coming up empty. Even the magpies were playing hard to get. The winter wildlife drought was not entirely surprising. It isn’t the best time to find living creatures on the prairies. It turns out people aren’t the only snowbirds heading for warmer climates. The rest of the creatures also seemed to disappear to a warm place. And there was also this tiny factor of photographer comfort. I told a guy once that canoeing in the rain didn’t work that well. He pointedly told me that canoes were all weather but some canoeists weren’t. Clearly, I’m not an all-weather canoeist or photographer! I’m not a psychologist but it seems that when you’re in a bad spot, the sensible thing would be to avoid counting the days. I did for awhile but somewhere past the 60-day mark I really wanted to blame my grumpiness on something. After 70, I feared triple digits. It was hard to muster much sympathy when a wildlife photographer complained to me about getting skunked one day in a row. I went back and double checked my count. No matter how far away, or how low the odds of getting a great photo, it’s fun to watch wildlife in my lens. Last week I was driving home when I noticed a coyote in a field. I raced home and got my camera. And then it came to pass. I found myself parked at the side of the road with cars whizzing in front of my lens. The camera was toasty warm in the truck while half my lens was half frozen from sticking out in the -24C air. The coyote was ridiculously far away, the light was wrong and I knew it was highly unlikely I would get good shots. But I was ecstatic to be photographing wildlife again after 78 days. I liked the plodding demeanour of this coyote – a metaphor of me of driving around endlessly and not finding any wildlife to shoot. On the other hand, the coyote’s plodding was so much fun to watch. I love that quote about canoes being all-weather and the canoeist being the deciding factor! I agree with you that enjoying the experience is part of the purpose of doing whatever you do, but still love that notion of taking responsibility and not- blaming it on the canoe, as it were. 🙂 Something I’d do well to remember! I was hoping someone would like that one. It’s a tough thing to balance sometimes – how much pain still makes it worth it? I appreciate the comment. I have days and sometimes weeks like that too, Lyle. Even more ridiculous in my case, as I will photograph anything nature related, so if no flowers, then a sunrise or colorful trees or interesting clouds or ice….. As with most things photographic, the photographer that makes or breaks the deal. I don’t care to be cold either. It was very nice of the coyote to remain where it was while you got your camera and not all that bad an image as running around in field looking for mice is a coyote’s life. Sorry to hear that you hit drought spots too though having a broader interest likely shortens them. Maybe I just need to toughen up and spend more time in worse weather to get more shots. I thot it was quite polite of that coyote to stay in the field until I got back. In fact, it was actually in a better position. How often does that happen? I love that your drought was broken by the lowly coyote, often derided and sneered at by those looking for more worthy wildlife to photograph. I kind of like the scrappy coyote. I suppose everyone has their own pecking order for the animals they like. I have a lot of respect for predators and quite like the coyote. It’s scrappy, a survivor and I like the looks of them. 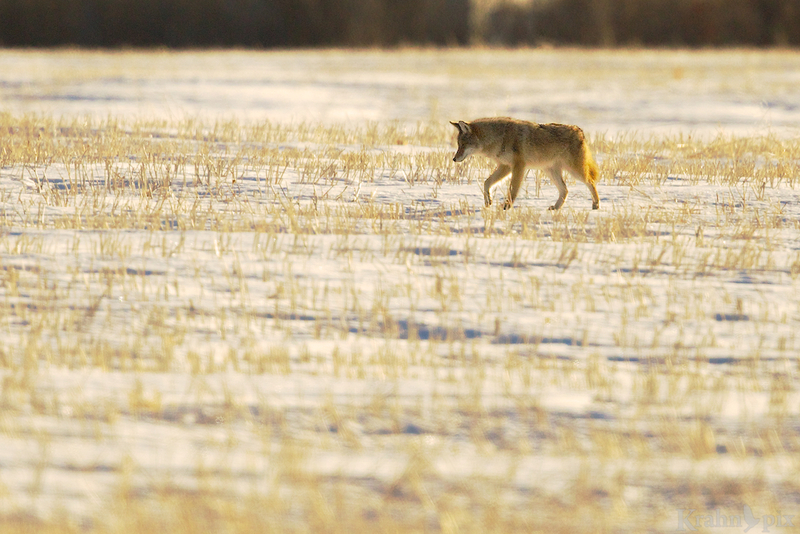 Glad to read and see the streak broken and this beautiful coyote find its way into the focus of your lens. And I was happy and relieved to have it happen. It certainly made for a fun day. I enjoy wildlife photography, but I prefer landscapes. Landscapes always are there and don’ t hide behind bushes. And unlike people, I don’t need their permission. Are there any zoos in our area? That might kill a drought. I used to like landscapes better but over the years that has switched – quite dramatically actually. On the drought days I wish I could go back but there’s no easy explanation of why you like certain foods or photos. On top of that, zoo animals just don’t seem like wildlife. Did I mention that I know how to make my life difficult? Love the shots. We [photographers] do go through great lengths to pursue our passions. Thanks. There is a passion that keeps us coming back otherwise we would have abandoned ship long ago. Fantastic pictures, Lyle! The first resembles a winter painting?! Thanks. I was trying for the painting look on that first one. It was actually quite a surreal scene. Hello Fellow this is a great and really and inspiring blog, I do not do photography but have much love respect for Nature and Wildlife at heart. It`s not just photographing but also adventure,glad you broke your drought with these excellent coyote shots in a terrific situation that according to my Friend POWEL, many photographers cant stand, Kudos… Adventure more discover more of yourself,The Hidden treasures in You! Thanks so much for your comments. Wildlife and nature are a powerful attraction to me so it’s natural for me to share what I’ve seen and photographed. Along the way I have discovered a lot about my world and myself. I’m happy you enjoy that too. Have to agree with Phil and Mike. Since it was so cold out maybe if you opened up the back door of your car and invited him, the coyote might have hopped in and gone for a ride with you to go pick up some fried chicken or perhaps burgers. I only mention that because last week they released some brown pelicans into the marsh that had been rehabbed from injuries but one wouldn’t leave the car. So now I’m starting to think many of these animals are much smarter then we give then credit. Anyway glad you broke your drought with these excellent coyote shots in a terrific setting. I never thot of inviting the coyote in but based on the strong evidence you provided with the pelican, I may have missed an opportunity. I’ll have to remember that next time though I’m not sure how good it would be at sharing fries! Sometimes it seems like we wildlife photographers need a creed like that of the U.S. Postal Service, “Neither snow, nor rain, nor heat, nor gloom of night, stays these couriers from the swift completion of their appointed rounds.” That quotation actually dates back to about 500 BC and a Greek historian’s (Herodotus) description of the Persian system of couriers. Patience and perseverance are absolute requirements for anyone that dares to search for and photograph wildlife in a climatic region as severe as yours, when success is far from guaranteed, even when you complete your appointed rounds. Elks and a coyote–most of us never put ourselves in positions where we might see them. Kudos to you for capturing them in beautiful images. A creed is a great idea. I may just be thinking about a Greek historian the next time I head out into less than ideal conditions. It really is fascinating to think about the pull that draws us out there, and despite many disappointments, keeps drawing us back. I appreciate your perspective.